Brigadier Lethbridge-Stewart has been remanded to Woodworms Scrubs Prison, and his team have no idea why. Secrecy surrounds his case, but his team barely have a chance to process anything before they are sent on a mission to Egypt. 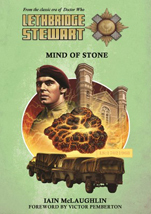 Why does it seem like Lethbridge-Stewart is going out of his way to court trouble from the prison's most notorious inmates? And what does it have to do with well-known gangster Hugh Godfrey? In the Ptolemaic Museum of Cairo, Anne Travers and her team are trying to uncover the mystery surrounding some very unusual stone statues. One thing connects these events; the cargo transported by Colonel Pemberton and Captain Knight in August 1968. This year we will be offering a subscription service. Buy five books get the sixth free for the reduced price of £45. Subscriptions started in 2016 will receive the six books released in 2016 (series 2 & 3). Customers that start from series 3 will receive series 3 (2016) & 4 (2017). (Minimum 12-month subscription required. Paid in two installments: First installment [£22.50] will be taken upon placement of order, and second installment [£22.50] will be taken six months later. If you wish to cancel your subscription, you must do so one month before renewal. After which, the next installment will be taken for the 2017 series of books.